Laser drilling techniques and energy control for LARGE microvias are the critical elements for balancing speed (cost), quality, and premature interconnect failure modes. 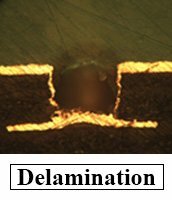 Poor energy delivery methods like trepanning can breakdown dielectric to copper adhesion that promotes delamination. Some laminates rely on a mechanical bond as part of the overall bonding system. Generating too much heat during the drilling process can compromise these bonds with centralized CTE effect. 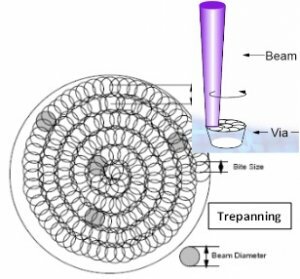 The trepanning method implores the overlapping of energy in a spiral configuration to cover the area larger than the beam diameter itself. This produces an uneven distribution of energy across the copper surface and a propensity for ‘hot spots’. 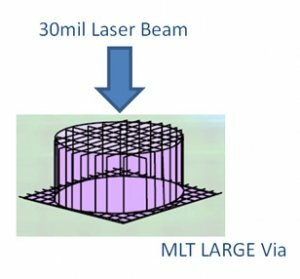 MLT implores CO2 systems with beam diameters up to 30mils generating an even distribution of energy for LARGE via applications.